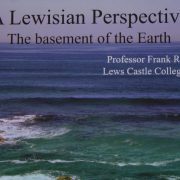 On March 6th Frank Rennie, Professor of Professional Rural Development at Lews Castle College, UHI, gave a fascinating lecture and comprehensive introductory tour of the geology of the Isle of Lewis. The geology of the Lewisian gneisses is complicated, but is so much more than simply boring monotypic banded rocks, and this lecture highlighted features to look out for in the landscape. If there are such ‘nameless things’, and if they have been down at the roots of the mountains since the beginning of time, at about 3.2 billion years ago they would have witnessed (and likely munched on) the earliest forms of what we now know as Lewisian gneisses. These rocks formed in the root zone of a gigantic mountain range. What we see today are the worn-down roots of a once-mighty mountain belt. This is the end state of mountain building which, millions of years in the future, even the young Alps and the middle-aged Appalachians will approach. The rocks formed 35 – 40 km deep in the crust in a highly metamorphic environment, at temperatures of ~ 900° C and a pressure of ~10 kbar. At the time of their formation, the rocks were buried in the Earth’s crust positioned at the South Pole. But while their formation started at 3.2 billion years ago, the gneisses as a whole spanned a period of roughly 1.5 billion years, a detail often overlooked when the immense age of these rocks is mentioned. In order to make this inconceivable time span more tangible, Professor Rennie used one year to represent the whole of Deep Time. In this comparison the Outer Hebrides formed between February and June, while the Lewisian gneisses appeared around May. Fortunately, we can be quite sure that no creature had them for elevenses, for on this time-scale even the first fish appeared only in November. Three types of Lewisian gneisses can be found: metasediments, granitic gneisses and undifferentiated gneiss which cannot be placed in either category, and is often referred to as ‘banded’ or ‘grey’ gneiss. This latter is a highly dense rock that doesn’t break or weather easily. The thin section (see presentation) shows crystals elongated by pressure on the matrix. Other tension-related phenomena, for example boudins, or pods, occur as well. The gneiss may be the rock on which Lewis rests for the most part, but most of it is hidden under grass, peat and other surface covers. Outcrops are mostly found along rivers or at the coast. At Ness, a flaggy and fractured metasedimentary assemblage can be seen, while at Scourie a dyke shows in the form of its absence – the intrusion building the dyke weathered easier than the grey gneiss, which is much less susceptible to erosion. In Dail Beag Precambrian granites cut through the gneiss. The landscape of the Outer Hebrides both directed and was shaped by ice flow during the last Ice Age. Signs of this can be seen in Sough Galson or in the interesting raised beach over glacial till at Habost. The geology of Lewis and its gneisses is much more complicated than many are aware of or care to learn about. On the other hand, there is demand for education – local people as well as visitors show their interest. Professor Rennie told of rocks brought to him for identification, and requests to lead geology tours around Lewis. Maybe, with the help of the geological institutions in Scotland and the new Scottish Geology Trust, geological ‘wildlife safaris’ and / or rock identification events similar to those held for mushrooms (albeit with a less dangerous background) could be organised in the future. Many are aware that Lewisian geology is more akin to that of Greenland than mainland Scotland. The question, however, why the Atlantic opened to the West of Lewis, instead of separating it from Scotland and keeping it nice and tidy with Greenland, could not be answered. This is a conundrum for future geologists to research and resolve. 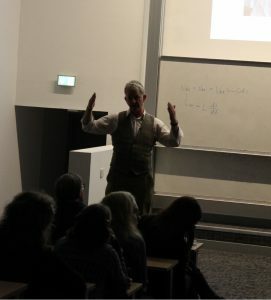 Our heartfelt thanks go to Professor Rennie for investing time and effort in both this highly interesting lecture and his long-awaited visit to Edinburgh.